India and Singapore today launched the 3rd Review of India Singapore Comprehensive Economic Cooperation Agreement (CECA) in Singapore. The review was launched by India’s Minister of Commerce & Industry and Civil Aviation, Suresh Prabhu, and Minister of Trade Relations of Singapore, S Iswaran. The launch of the review signals further deepening of business, economic and trade collaboration between the two countries. The two leaders also discussed ways to further promote trade of goods, services and boosting investments.Singapore is the second largest trading partner of India within ASEAN and India is the largest trading partner of Singapore in South Asia, with a bilateral trade of USD 17.7 billion in 2017-18. Singapore’s trade with India constitutes about 21.8% of our total trade with ASEAN and 2.3% of our global trade. India had a trade surplus of USD 2.73 billion with Singapore in 2017-18.Commerce Minister Suresh Prabhu also participated in the 15th ASEAN Economic Ministers-India Consultations. 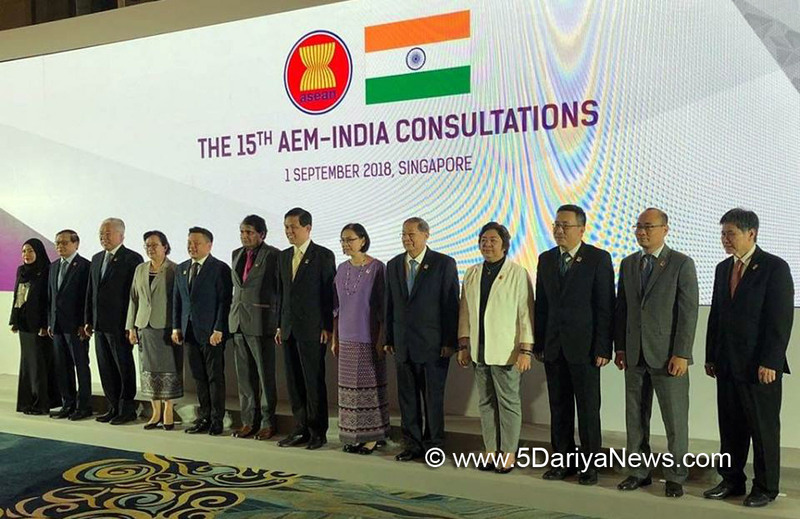 In the meeting, India reaffirmed the need for review of ASEAN-India Trade in Goods Agreement.The Indian Commerce & Industry Ministry attended East Asia Summit (EAS), where the members exchanged views on regional and global trade. On the side lines of Regional Comprehensive Economic Partnership (RCEP) Ministerial Meeting in Singapore, Suresh Prabhu held series of meetings with the Trade and Industry Ministers of Japan, New Zealand and ASEAN countries.During his bilateral meeting with Mr Hiroshige Seko, Japan’s Minister of Economy, Trade and Industry, Suresh Prabhu sought greater Japanese collaboration and investments in automobiles, cargo aircrafts and manufacturing sectors. He assured India’s full cooperation in Japanese Township Projects in 12 Indian States. The Japanese Minister welcomed Indian Commerce and Industry Minister’s proposal seeking greater access for Indian nurses and healthcare service providers in Japan.During Commerce and Industry Minister’s meeting with New Zealand’s Minister of State, Mr. Damien O'Conner, New Zealand proposed to explore possibilities of making investments in Agri services in India.Suresh Prabhu discussed areas of mutual interest on trade including market access issues with the Trade Minister of Indonesia, Mr. Enggartiasto Lukita. With bilateral trade of USD 20.40 billion in 2017-18, Indonesia has emerged as India’s largest trading partner among the ASEAN countries.